Deborah, what it like for you to be coaxed back into singing and songwriting after so much time away? The only guests that Bob Dylan invited to join him on stage at the Nashville stop of the AmericanaramA tour were the McCrary Sisters: Ann, Regina, Alfreda and Deborah. Regina used to sing with him during his Slow Train Coming phase, and she and her sisters have lent their gospely melismas to truckloads of urban gospel, pop, country and Americana projects since. 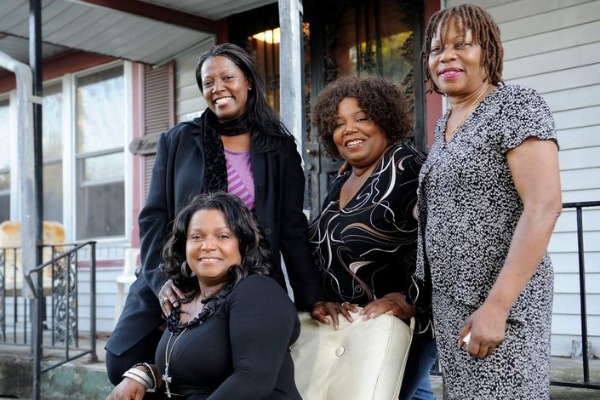 In the past few years, the McCrary sisters — whose father was Fairfield Four founder the Reverend Sam McCrary — have launched their own thing under their own name, releasing a pair of albums stocked with original songs. First came Our Journey and this year’s follow-up is All the Way, and album that more than does justice to their down-home to up-to-date and urban stylistic range. Read on for what the Sisters had to say about writing songs that got them through dark times, song that got their kids dancing, songs they didn’t even realize were songs at first, and a particular song whose co-writer is none other than Dylan. You so often heard your father’s a capella gospel group, the Fairfield Four, rehearsing during your formative years. Are there any particular songs or arrangements on the new album that you feel like show that influence? Regina: “Hum and Moan.” When I wrote that, I was thinking about the Fairfield Four, and I was thinking about the church that we grew up in, St. Mark’s Baptist Church. It’s over in Germantown. The deacons and the mothers, they used to do an old thing called Dr. Watts. It was an old hymn. It was kinda like back in the slavery days when they wanted to get messages to each other and not let the master know what they were talking about. That’s where all that came from. …There was this woman—she’s dead now—Sister Roper, baby. She would start out doing old Dr. Watts and everybody was listening. At that time, I was so young I thought it was funny, because I was like, “What are they sayin’?” Turned out when I got older and life started dealin’ what life deals to you that Dr. Watts came [closer] to reality. Freda: And I think “The Ways of the World” does. I’m not saying that when I sat down and wrote it that I thought that, but as I listened to the music, that has an old quartet feel to it. At the end of the song, the vamp, it has that quartet style to it a little bit. Singing together has been a lifelong thing for you. In the past decade, I’ve seen you sing behind other acts, like Buddy Miller and Mike Farris, more times than I can count. Was there a point when you felt like you’d really established the McCrary sisters as a performing and recording group in your own right? Ann: We had a group some years back. It was called the CBS Singers: Cousins, Brothers and Sisters. And it was cousins, brothers and sisters. We sang a lot around town. …But as life goes, we had other things we wanted to do individually. So we just started branching off and doing our own thing. After a while, Regina and I started singing together again, first with Bobby Jones. That’s the first time we had been together. Then we started going out with Buddy Miller, and then eventually with Mike Farris. Then Freda started singing with us with Mike, and people started asking us, “Where’s your CD? Do you have a CD?” We were like, “We don’t have one.” They were like, “We want your CDs!” So that’s when we decided, “Hey, we’ve got to do it.” And we called Deborah. Deborah was a nurse, so we called her in [so we could have all] four sisters. Perfect timing is everything, and this was the time that we finally got together to do this.